Fresh off playing The Rub in NY, Kutcorners and Marvel have been taking their “Live Set” across Canada and the U.S. tearing the roof off every stop along the way. 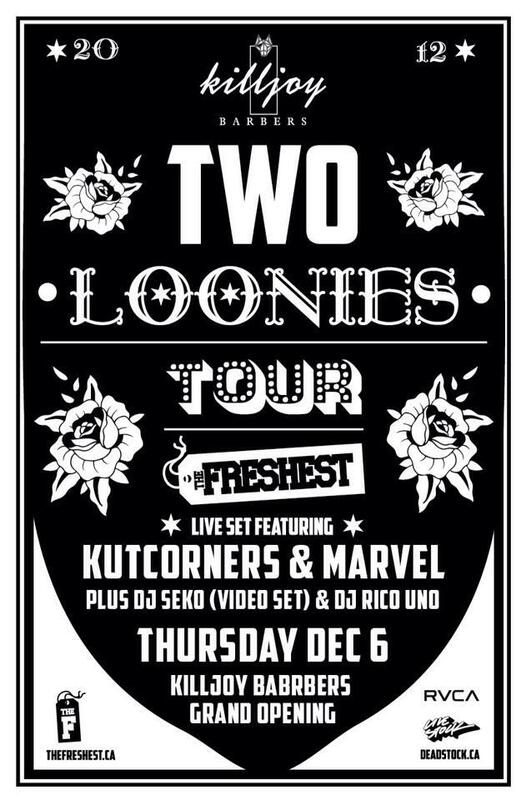 This Thursday, Dec 6th the “Two Loonies” Tour is touching down inside The Kill Joy in Yaletown for this one night only pop up show. The Vancouver show is an important one to "The Freshest". The crew has recently expanded and relocated to different regions of the globe and will re-unite for this one special show in their hometown. The night will showcase brand new material from Kutcorners and Marvel's “Live Set”, a special “Video Set” by DJ Seko, plus DJ sets from Rico Uno and the gang. The Vancouver date of the “Two Loonies” tour isn’t just a party, it’s a show and an event all wrapped up in one evening of good music and good times. And it’s free!